Marañón Waterkeeper is a community lead organisation that is working to protect the Marañón River, hydrological source of the Amazon. 20 mega dams planned along the Marañón would turn its 900km of whitewater into a series of stagnant reservoirs, block passage of 23 migratory fish species, and have massive impacts on the Amazon below. Marañón Waterkeeper is creating conservation areas to block dams in critical areas, creating educational campaigns in local communities, and assisting community activists all for one purpose; to ensure the source of the Amazon continues to flow free, forever. river ecosystems have been conducted by our association. Our association have already established collaborations with all states authorities responsible for water management. Continuously, we support them with our expertise and results of our monitoring in the field. of mini hydro power plants on Bukovica River would lead to the destruction of the river ecosystem. subsist endemic and stenoderma species. „Bukovica 2“, on the Bukovica River, in the municipality of Savnik“. influences. We want to stop the construction of dams and hydroelectric power plants on our rivers. Our campaign aims mainly to protect the Bisri River and Valley from a World Bank-funded large dam. The dam will cause extensive damage to the river and its ecosystem, destroying 6 million sqaure meteres of natural and agricultural lands, in addition to 50 historical sites. We also raise awareness of the dam's negative impacts, and we promote sustainable water management solutions to avoid the destruction of the Bisri River. Anup Gurung is a passionate kayaker and the founder and president of Nepal Kayak Club. With NKC, he has been organizing training and events to empower Nepalese paddlers and promote the Nepali whitewater scene. Through the Express Serie Championships, NKC has been promoting awareness about rivers threatened by hydropower such as the Bhotekoshi, Marsyangdi and Modi Khola with the "paddle it before it dries out" slogan. Now, with team Mission East to West, he has set out to explore all the major rivers of Nepal to explore not only the landscape but also the communities and cultures thriving and surviving by these rivers. By exploring these stories through film and stills, he hopes to raise awareness about the plight of Nepali rivers. He is joined mainly by three strong Nepali paddlers - Hari Ale, Roshan Lama and Tarjan Gurung who are all members of the Nepal Kayak Club as well as national and international kayakers for portions of their journey. They are supported by Kripa Dongol who has been helping the Nepal Kayak Club with events and outreach. She is a writer and researcher exploring intersections of environment and development in Nepal and will be managing logistics for ME2W and joining them for portions of the expedition to document their stories. The Saalach Allianz is working on and against several projects at Saalach river. Currently they are facing plans for a cross-border devision dam ("Schlauchwehr") in Unken, Austria. The project has been submitted to authorities only in November 2018. At this early stage of the permission process a lot can be done to protect the Saalach river and to prevent the building of the dam. The Free Rivers Fund supports the Saalach Allianz in their struggle against the dam in Unken. Center for Environment (CfE) is a non-profit, non-governmental and non-partisan association. Our work is mostly related to rivers in recent years, protecting them from hydropower projects and so far we have been successful in preserving Vrbas, Hrčavka and Sutjeska rivers. increasing public awareness about the urgent need for its protection. Balkan Rivers Tour started from a crazy idea born in the head of Rok Rozman at the pub one late evening. Intention to expose the insane dam craze and attack of greed in the Balkans to the world, connect grass roots activists from the region and prove that nature conservation is anything but boring and reserved just for experts became real project in just 6 months. With 1.500 participants, 23 paddled rivers in 6 countries and 18 participating nations it was and still is the biggest river conservation project in Europe. But what is even more important – it is now spontaneously becoming a movement that is gaining publicity and reach trough one simple truth; saving rivers is rock’n’roll and paddling is so much better when you give it a purpose. After five years of campaigning we have called to account the thin plans to build in the Conwy, and planning permission and water abstraction have not been granted. But there are a great many other free flowing rivers in the UK, which remain under threat of irreversible development. ‘Save the Conwy’ has now become ‘Save Our Rivers’ and we have become a UK charity. We’re here to help and to encourage the scrutiny of these plans by local communities and all of us who love the outdoor life. WET - Wildwasser Erhalten Tirol is committed to the preservation of the last undeveloped rivers and streams of the Tyrol region of Austria and aims to constantly improve the ecological state of Tyrolean waters. WET is very critical of the expansion of hydropower in Tyrol and informs the affected population of its effects through information events and public relations work. The members of the WET are very active in the campaign against the planned expansion of the Sellrain-Silz power plant group and have been achieving positive changes in the project as a part of the EIA procedure. The final goal - to stop the expansion of Sellrain-Silz and prevent water drainage from the Stubaital - is getting closer and closer. Save the Conwy is a kayaker led NGO based in the Snowdonia National Park. It has been campaigning against the building of a run of river HEP scheme on the Fairy Glen section of the Afon Conwy. A scheme that would threaten a SSSI site famous for it's endangered celtic rainforest plant species, block the migration route for both Salmon and Sea Trout and drain the flow from the best section of white water in the UK. 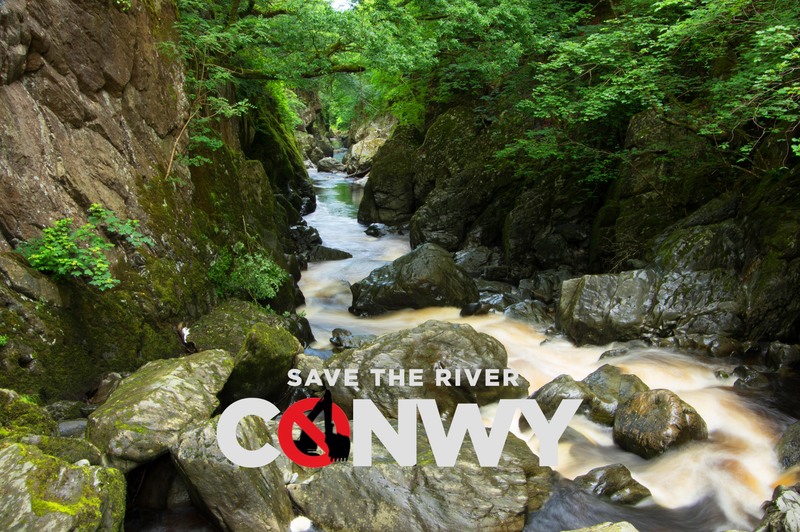 By working side by side with traditional environmental NGOs and other river users Save the Conwy has been able to hold off this damaging proposal since 2013 and hopes to protect this beautiful rivers future for everyone to enjoy.